01. Sit down servant (Trad. arr. Liz McComb) 06'19"
02. Come on in this house / If you don't (Trad. arr. Liz McComb) 07'22"
03. What happened to the love (Trad. arr. Liz McComb) 07'22"
04. Let the church roll on (Trad. arr. 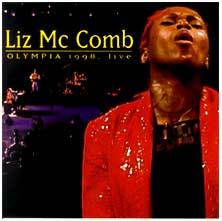 Liz McComb) 03'56"
05. Certainly Lord (Trad. arr. Liz McComb) 05'07"
06. The man upstairs (Liz McComb) 03'51"
07. All the way (Trad. arr. Liz McComb) 04'22"
08. Drive old Satan away (Trad. arr. Liz McComb) 05'35"
09. Fire (Liz McComb) 11'11"
10. Wayfaring stranger (Trad. arr. Liz McComb) 04'29"
11. Time is now (Liz McComb) 05'20"